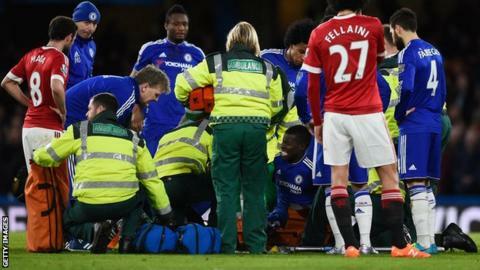 Chelsea defender Kurt Zouma will have a scan on a serious-looking knee injury he suffered in Sunday's 1-1 draw with Manchester United. The 21-year-old landed awkwardly after contesting a high ball and had to be stretchered off at Stamford Bridge. "Tomorrow we know more, but if you saw the injury - and everyone has seen how bad it is - hyperextension is always bad," said interim boss Guus Hiddink. French centre-back Zouma has made 32 appearances for Chelsea this term. On how long Zouma might be sidelined, Hiddink added: "I am not a doctor but he will have an MRI scan tomorrow. Let us wait and hope,"
Blues striker Diego Costa scored a late equaliser to preserve Chelsea's unbeaten record under Hiddink and deny Manchester United a win after Jesse Lingard's opener.